After receiving a hot tip from one of my friends, I decided to try a local back country creek near Durham for native brookies. 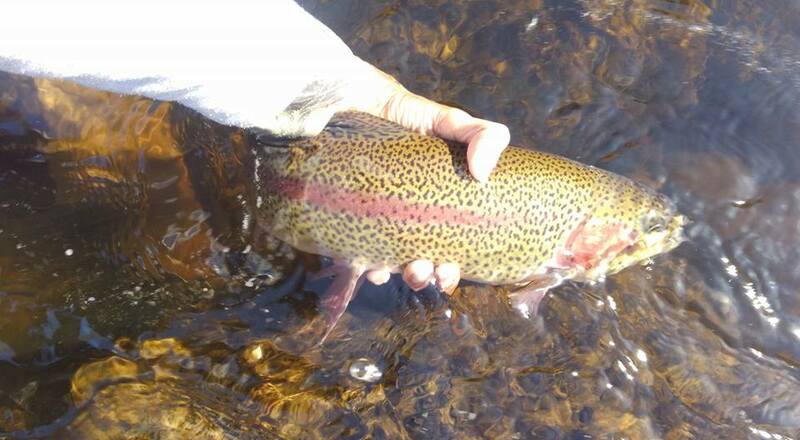 According to this friend, a recent electroshock survey revealed that this stream was loaded to the brim with fish (more so than some productive White Mountains streams) so I really had to give it a go. When I got there, I wasn't shocked to see that it was a little back country stream. I had always passed this way to hit larger streams and ponds without paying it any mind. The thing that really shocked me was how cold the water was and how deep and dark the pools were. I immediately found a nice pool with a nice log at the head so my game plan was to prospect upstream with a #16 EHC stimulator until I got to the head (where I thought the fish would be). Oddly enough, none of my casts were met with any interest what so ever. It was very unusual considering that wild brookies are very prospective and opportunistic. Either the fish were super spooky, super finicky, or just not interested in dries. Nevertheless, I decided the water looked too good to not have any fish so I continued downstream to find better holding areas. Eventually, I stumbled upon a nice log where a "deep" riffle ran through and it looked just too good to pass up. I immediately shot a bow and arrow cast and let the fly skitter down. On my second or third drift, I felt weight. Thinking I was snagged, I pulled upstream but felt it fighting back! Soon, I pulled to hand a nice 5 in. native that promptly popped off before I got its photo. Oh well, in went the second cast. This time, I did get snagged and in the process of wading in and freeing it up, I spooked several decent fish. Not ideal but at least I knew that my catch wasn't an anomaly. I continued downstream and found a nice, long slow run. This water looked insanely good but again, nothing. I did see a couple fish rising but as I tried to set up in a good position, I lost my footing on the mud bank and splashed. I looked and felt like an idiot and I lost my chance. Defeated, I walked upstream and continued prospecting with an #14 wulff (had to change something) but nothing changed. By this point, I really felt disheartened. Either I was doing something really wrong or this fish really wanted nothing to do with a dry. Eventually, I made it back to the log and pulled out another fish, this time on a simple downstream dead drift so I figured it wasn't really all me (or was it?). Eventually, I was able to fool a fish in the slower water. I saw it actively rising and I quietly snuck upstream and dead drifted my offering downstream to its lie. I had it on for a few seconds but it got off since I built up too much slack in the presentation. Still, it helped my case to have snuck up on a fish and fooled it on a day I felt that I may have been off. I got a nice one on a swung wooly bugger to end before a surprise storm chased me out. All in all, it was a very odd day. First off, I found it odd that brookies weren't more aggressive. I've fished streams of this size and had them try to sink a dry as soon as it lands but today they couldn't be fooled unless they were rising or were under a log (weird?). Second, all my fish were caught on downstream presentations. Usually a mix of both produce fish but yesterday, I had to choice but to present downstream in some cases. Then again it could have been my super long leader not turning the flies but it was an enigma of a day none the less. Still, it was not too bad putting in work for a few fish directly after a banner day.